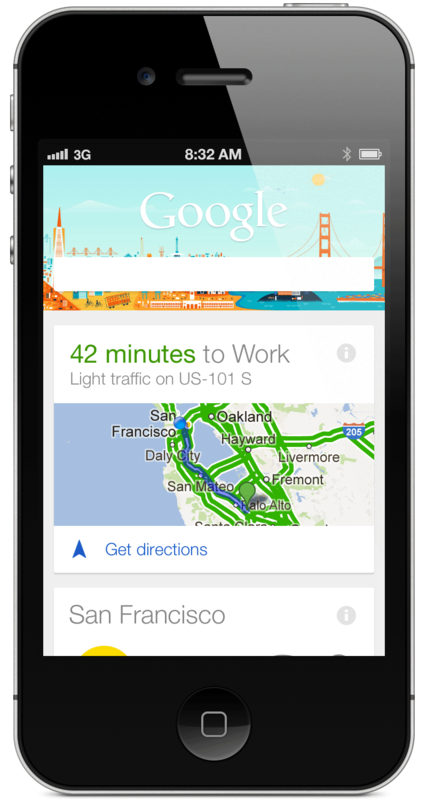 Today, Google expands its predictive search tool Google Now from Android to iOS. 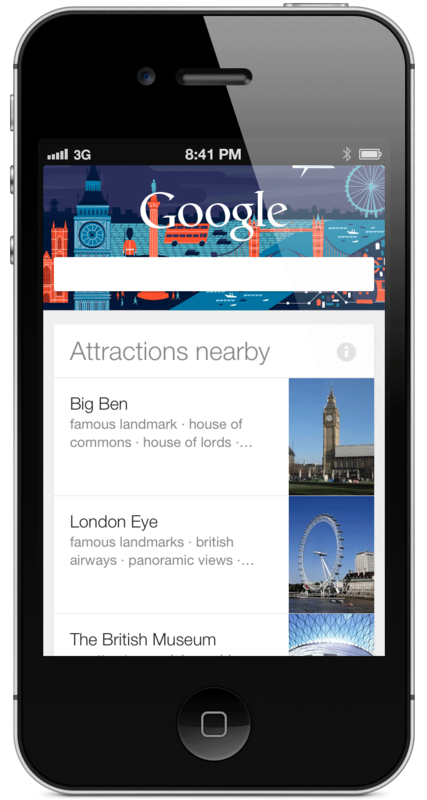 Now is being made available in an update to the Google Search app, which is available on the App Store now. The app works from the Google Search app on either iPhone or iPad, and is fully opt-in (also see demo video below). Because of the unique partitioned nature of iOS, Google Now can only be activated from within the Search app, and it must be turned on by a user, who will be prompted on launch of the updated app and must sign in to a Google account. Once you’ve given Now permission to turn itself on, it can be accessed inside the Search app only. This is one of the differences between Now in iOS vs Now on Android, but it’s mitigated a bit by the fact that you can swipe up in the Search app to activate Now, a gesture reminiscent of the way that you bring it up on Android. But, of course, you can’t simply do it from any system-wide location on iOS. This may limit the accessibility of Google Now on iOS, but it doesn’t limit its utility. All of the same signals are still being leveraged as they are on Android, including Gmail, calendar, location, search behavior and more. Those signals are mined to give you a contextual picture of not only what you’re doing now but what you will be doing. That’s what Google Now Product Management Director Baris Gultekin sees as the strength of the work they’re doing. “You’re searching with your context, and constantly searching to find anything of relevance [with Google Now],” Gultekin says. The way that you use Google services, and how much you use them, will have a lot to do with how helpful Google Now is to you. Gultekin, alongside Google Maps folks Andrew Kirmse and Ben Gomes, was on the team that created Google Now originally. The feature started as a ‘20% time’ project, a provision that allows Google employees to hack away on side projects on a portion of their work hours. Many mainstay Google projects like Gmail have come out of this, so it’s not too surprising to see something like Now arise from the same sense of curiosity. That still leaves more than two dozen others including the major stuff like weather, traffic, flights, hotels, appointments, packages, restaurant reservations, public transit, movie tickets, currency conversions and translation. There’s still a lot to love here. Google Now remains a uniquely compelling experience that only Google is gathering and parsing enough data to replicate. There’s simply nothing that compares on iOS yet, including Siri. A lot of this power lies in Now’s predictive nature. The iOS version of Now uses WiFi location only, not GPS, this will conserve battery by recognizing entrance and exits from locations of importance. This lets Now keep track of things like the route that you have to travel on your way to work in the morning, letting you know when the best time to leave would be to get there with current traffic conditions in play. Unfortunately, at the moment, Now does not utilize push notifications on iOS at all. This means that you’re going to need to visit the Google Now app in order to get those predictive notices. Gultekin says that this is something that they’re investigating, but that they want to do it right without bombarding users with notices. In reality, Google Now is just another permutation of Google’s expertise with search. But now, instead of waiting for you to issue a query, it’s predicting what information you need to know and when. It’s one of those things that really couldn’t have been done without this host of signals that Google has to tap into. It’s a product created out of the coalescing of smartphone and Internet connection ubiquity and large cloud stores of information that say a lot about us and our lives. That may be daunting or even frightening to some, but the truth is that the amount of data being gathered on all of us via purchasing, email, calendar applications and information systems around the world is growing by the day. That’s going to happen whether we like it or not for the most part, and Google Now is one of the products actively looking to hook all of those together to create a powerful tool that we can use to make our lives easier. I’ve been using Google Now for about a year on various Android devices, and I’m consistently delighted and impressed with it. In fact, it’s powerful enough for it to have become my main reason for keeping an Android device on my person. Now, it’s on iOS and in my pocket regardless of what device I’m on. Which is pretty much what Google is up to with all of its services, and I’m fine with that. For now, the Android version of Now features enough cool conveniences for me to wait and see, but if Google ramps up this version to keep it in parity with Android then iOS users are in for a treat.